Institut plánování a rozvoje hl. m. Prahy (IPR Praha) otevře ve svém sídle v areálu Emauzy nové Centrum architektury a městského plánování CAMP. Ačkoli oficiálně se CAMP otevře pro širokou veřejnost až v září, čtenáři časopisu ERA21 budou mít možnost nakouknout do nového prostoru již ve čtvrtek 25. května. Nepřehlédnutelnými událostmi uplynulého měsíce se stala dvě souhlasná vyjádření – jedno stavební povolení pro bytový Obličejový dům v sousedství Anežského kláštera od architekta Zdeňka Fránka a opětovné územní rozhodnutí pro administrativně-komerční Květinový dům na Václavském náměstí z projekční kanceláře Chapman Taylor. Na první pohled dvě velmi podobná dramata o zasazení nové architektury do kontextu historické Prahy. Ale jen na první pohled. 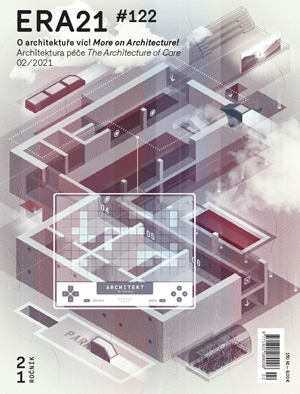 All over Europe, and the world, there are institutions acting as architecture liaisons to the public, be it nationwide or just locally in regions and cities. Here, in the Czech Republic, we don’t have an institution that could be labeled as a center of Czech architecture. This task is being taken up by various activist organizations, however, they are struggling with financial, personal, or legal limits. 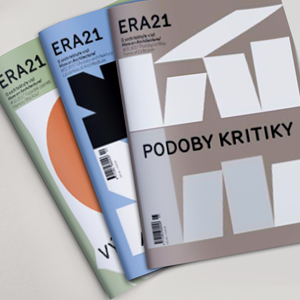 This issue of ERA21 is focused on institutions integrated in the official state or local administration structure. This unusual family house was built on a sloping site oriented to the north on the outskirts of Prague – in Kyje – overlooking the River Rokytka valley. The house reacts to the surrounding full-grown trees with its shape, character, and volume. The ground plan of the house is based on a circle that transforms into two squares on the southern side; the continuous three‑story space gets narrower towards the top of the house and ends with a skylight. The living room on the ground floor with a gallery oriented to the north thus receives sunlight from the south. The ground floor also houses a bedroom, kitchen and bathroom; another bedroom is available on the first floor, the gallery serves as a study room. The house is designed as a wooden structure with a reinforced concrete foundation that is limited to a stem in the steep slope. The wooden structure is acknowledged in the interior; the exterior is insulated with a polyurethane protective spray. A new multifunctional hall was opened in Líbeznice u Prahy in November, designed to serve for gym classes as well as leisure clubs, cultural and social events. The two-story building makes use of the difference in heights of the adjacent street and football field. This enables it to be sensitively incorporated in the surrounding development of mostly family houses, and allows for barrier-free access to both floors. The building has an oval ground plan and it is divided into three parts: the overtop sports hall in the middle and two lateral apsis, which provide space for additional functions. The main volume of the building is a wooden structure with a curtain façade system made of squared timber; the adjacent facility building is made of brick.